A Silverlake cottage, some blue and white moroccan tile, a red dress, and banana leaves are just a few of my favorite things from Christy Kendall’s maternity shoot, but my favorite part was when we were taking photos Christy repeatedly said the reason they were so comfortable taking getting all snuggled up on the bed together and kissing upwards of a hundred times with me in front of them was that she was just so in love with her husband. 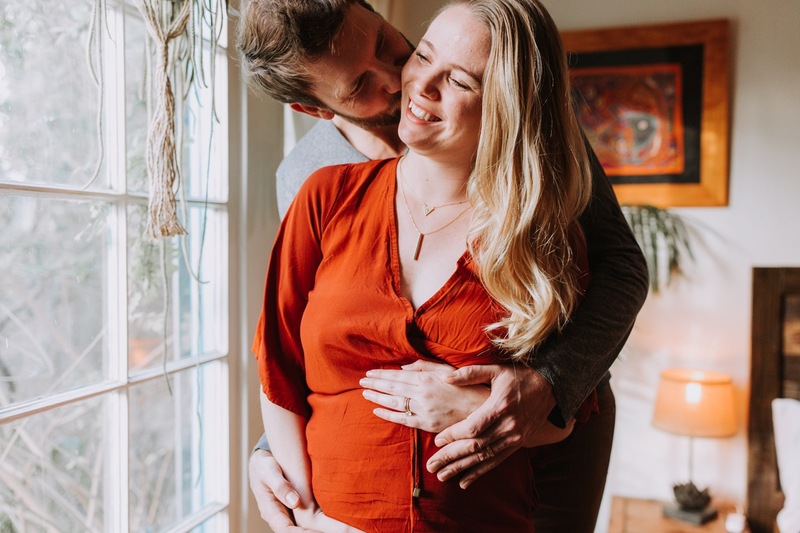 Their little baby girl is going to have all the love in the entire world showered upon her with such loving and gentle parents! Christy’s photos took us from the bedroom all the way to the backyard, looking like an absolute queen as she held her belly while laying effortlessly across a gorgeous blue lounge. If Vogue is looking for a new cover girl, I nominate Christy. You have to see it to believe it.